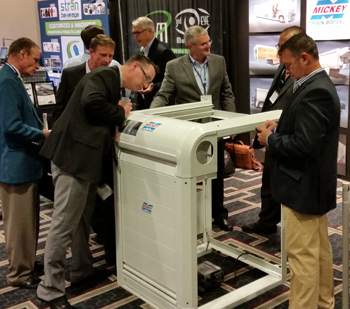 Attendees at the NBWA show in New Orleans take close up look at working model of Mickey’s new E-Lock. Mickey has introduced an electric locking system for its beverage-style roll-up door that is completely keyless. The automated locking system, which is controlled by a pair of switches mounted within easy reach of the driver’s seat, was designed to eliminate 3 of the biggest problems facing beverage delivery companies: break-ins, frozen locks, and lost keys. “Our new E-Lock virtually eliminates break-ins and is immune to weather because there is no visible locking device on the outside of the unit,” says Tom Arland, Mickey’s VP Sales, Beverage & Engineered Vehicles. Based on data compiled by Mickey’s beverage customers, the average theft per truck is estimated up to $1,000 per year, so a fleet of 50 trucks equipped with the Mickey E-Lock system could save a wholesaler or distributor $50,000 a year. Curbside and roadside doors are locked and unlocked separately with the E-Lock system. In addition, a failsafe mechanism keeps doors from locking when they are opened, which protects paint and decals, and indicator lights on the dashboard illuminate when the doors are unlocked. A manual bypass system activates in case of power failure. Click HERE for more information on the Mickey E-Lock.